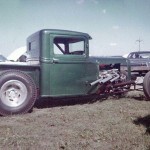 Dad’s 1932 Ford PU at theGreat Lakes Dragway in Union Grove, WI. Power from a 283 cu.in Chevy with an Isky roller cam, Vertex Magneto, and Algon fuel injection. All on his home made tube chassis. Best times were 11.80 sec @ 119MPH. Push car was his brand new 61 Chevy bubble top.